Rolf was visiting Scotland and he and I met up to taste through his wines over a long morning and lunchtime. With another engagement beckoning, I left him with 10 bottles open in front of him, about to summon the waiting staff to order up sufficient food to do some justice to the wines. I got the feeling Rolf rather likes his job! The irrepressible Rolf is a huge enthusiast for his own wines, just as happy extolling the glories of traditional Austrian grapes varieties as he is telling you of his wonderfully healthy Syrah. He even tried to convince me that Austria could lay claim to having ‘invented’ the world’s most popular white wine tipple: that evidence has been found of Chardonnay growing in the region 1,000 years BC or so. His vineyards are organic and a version of biodynamism is practised. He uses no sulphur at any stage of the winemaking process. His watchword is ‘gentle’ winemaking; a very much hands-off, non technical approach.Austrian wines are something of an unknown quantity to most UK wine lovers, apart perhaps from the odd bottle of sweet wine, or the very occasional dry white. 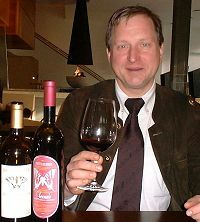 Rolf’s speciality is red, and what is more, full-blooded, structured reds which he makes from a range of both traditional Austrian grapes, and international varieties like Cabernet Sauvignon, Merlot and even Syrah. His vineyards are very old, and some plots are composed of 120 year old vines, with many 80 years old and more. He is clearly something of a quality obsessive: his Blauer Burgunder (Pinot Noir) 1997 is the first bottling in 14 years of growing the grapes, as it is the first time he has been 100% happy with the wine. Part of his ‘gentle’ winemaking philosophy extends to ageing his wines, which are brought to the market only when he feels they are mature; often four to six years after the vintage, having spent time in both barrel and bottle. Perhaps this patient approach extends back to the time he spent studying with a Yogi in India in the late 1960’s (though now the picture of Teutonic respectability, I suspect Rolf was a bit of a hippy). Rolf’s vineyards lie in two contrasting sites, giving him a range of ‘terroirs’ and growing options. The Tattendorf vineyards are in the Thermenregion, an area were hot springs abound and the gravely, loamy soils have plenty of lime, and hot, dry conditions lead to naturally restricted crops. The Zagersdorf vineyard is in Neusiedlersee-Hügelland, the hills above the lake, where heavy clay soils and high salinity again help keep yields under control. I was very impressed by this range of wines. Though perhaps a little expensive for what they are when viewed in a global context, they are without a doubt beautifully made and elegantly constructed wines of fine balance. The tasting was not blind. A rough price indication is given, but check with Raeburn Fine Wines who stock most of the range below. 10GBP=$15US. Extremely unusual late-harvest wine that Rolf insists fermented for three years in barrel! Portugieser is a Portuguese variety brought to Austria, and Rolf’s vines are 120 years old. This was harvested at Trockenbeerenauslese levels, but fermented out to an off-dry style. Wonderful nose, botrytis aromas with peach, honey, overripe melon and a lovely sweet, dark, dried fruit flavour. Arrestingly complex, with notes of toffee and resin. The palate is full, with dry, waxy red fruit, strawberry and plum flavours of mature old wine, but still with good acidity. Should continue to drink well for a few more years yet. Amazing stuff. From Neusiedlersee-Hügelland, a 13 % alcohol blend, the Cabernet aged in older casks, the Blaufränkisch in new barriques. This has a soft, medium ruby colour and an elegant nose with ripe blackcurrant, cassis and red berry fruit. Tight and fruit-forward, the mouthfeel is rounded out by vanilla and there’s a certain earthiness. Tannins are fine and there’s a red cherry bite of acidity. Good length. Very good. St-Laurent is a traditional Austrian variety, and these are 80 year old vines, green harvested to maintain low yield. The wine was aged in Allier and Slovenian oak, 30% of which was new. Vibrant crimson colour still, and a fine, creamy, dark berry fruit nose: deep loganberry and plum aromas. On the palate it is silky and rich, with a little damp, forest floor note over soft strawberry fruit. The tannins are sweet and ripe, quite spicy, but with good balance and a mineral, clean finish. Very good. 100-year old vines. Medium/deep ruby with distinctly orange rim. Nose of leather, spices, morello cherry and a gravelly sweetness. On the palate it is firm with a briarwood and unusual tree bark quality, good and quite firm with powerful tannins and juicy acidity. This finishes with lovely clean tannins and acids and has very good length. Aged in all new Tyrolean oak and twice green harvested to reduce yields. Deep ruby core, with lightening rim. Some herbal notes and a powerful, almost cognac nose. The palate has a steeliness of structure with great juiciness of cherries and richer, sweeter berries. This begins to remind of a St-Emilion, with good length and balance. Very good. Very dark crimson/purple, but not opaque. The nose of pepper, spice and deep blackberry fruit suggests classy Northern Rhone. A nice gravelly, mineral core too. The palate has firm cherry fruit and a tight, focused core of ripe blackcurrant and raspberry. Very tight, with grippy tannins and good acidity, but such a lot of concentrated black fruits too. Long and savoury, with a deep seam of fruit. Very good indeed. 40% Cabernet Sauvignon, 40% Merlot, 20% Cabernet Franc. From the Thermenregion, medium density, ruby/brick colour and with finely-wrought black fruits on the nose. There’s a good deal of herbal, leafy blackcurrant and beneath, a minty suggestion. On the palate it is very juicy and firm with a cedary quality of tobacco-tinged black fruit. There are fine tannins again that give a liquoricy grip and a black olive savouriness. Very good. How unusual is this? 50% of the wine is 1995 Syrah, 50% a barrique-aged blend of three Austrian grapes from 1992! The colour is a medium ruby crimson, and there’s a distinct bloody, meaty, animal note on the nose. Some damp earthiness too, and a little coffee-bean oak. The palate is grippy with quite good fruit, but I don’t think this wine really carries through with enough class and length. Only 2,000 bottles made. The only wine closed with a ‘Neocork’. This is a very dark wine; crimson with black at core. There’s a delightful truffle note, quite aromatic, with wild strawberry and a briary quality. The mouthfeel is silky and expansive, with firm, mineral and riper, sweet fruit character. A nice balance of tannins and acidity, with expressive, generous fruit on the mid palate and fine length. This is very long and quite complex. Very good indeed.